Deck the Halls with…Bales of Wool? Last week, Mayfair Games announced their Catan Ornament for 2012; this year is their third release in the line, and the featured resource is wool. It’s a cut brass ornament featuring iconic symbols from the island of Catan. 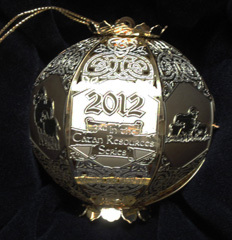 For more information and a sneak peek at another ornament offered this year just follow this link. Thanks for reading and stay tuned this week for more from our 2012 Christmas Holiday Gift Guide!